Also coming hopefully soon is an updated PS/2 version which hopefully doesn't require rebuilding the kernel. Finally, I started a little work on supporting the PACDrive. It's very early, but looks like it shouldn't be too difficult. Any feedback on the USB version of ipacutil would be great -- even if it's working great. I have only been able to test I-PAC2/4 since those are the boards I have. 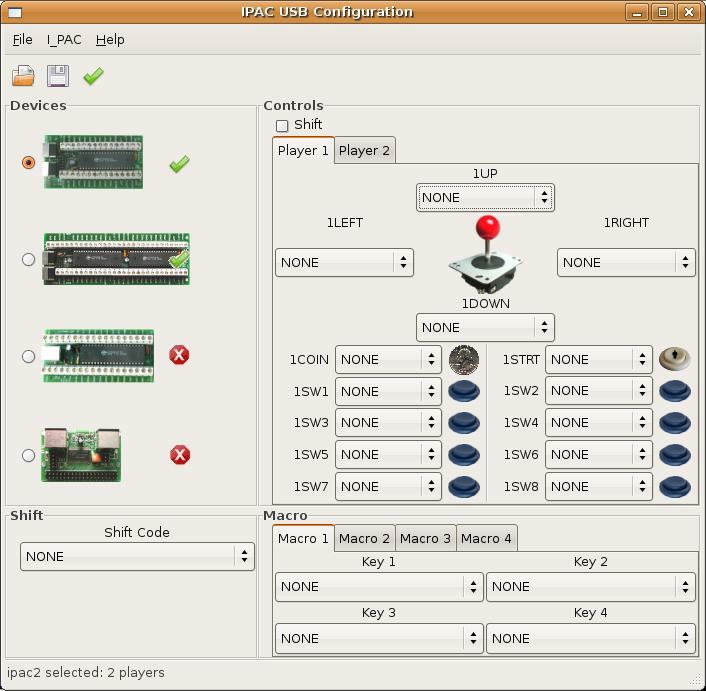 GUI for USB I-PACs: You'll need the ipacutil package as well. Command line version for USB I-PACs: this supports IPAC2/IPAC4/IPAC VE/MiniPac VE. These files are here only for those who might have old boards. They will only work with 2.4 and older Linux kernels and very old I-PAC2s. If you want to use this with 2.6 kernels and old I-PACs, you'll need a kernel patch and need to define ARCH_OTHER in the makefile (and comment out ARCH_I386). See Adrian Montero's website for more information. A big thanks to Adrian.